Charles Bamford Daniel was born in London on the 6th day of July 1883, and duly registered on the 14th day of August 1883. The original of this certification is on record and held amongst the papers relating to his life. The middle name of Bamford given to Charles comes from his grandfather Thomas Bamford Daniel, the source of this name before this was from Elizabeth Bamford, Thomas’ mother’s maiden name. My father was the first issue of his father’s second marriage, there being two other sons by the first marriage of my grand-parents. I never did find out the reason for gran-pappy’s second marriage or why he immigrated to New Zealand. Suffice that my father was about 2 1/2 years old on arrival in New Zealand at Auckland. 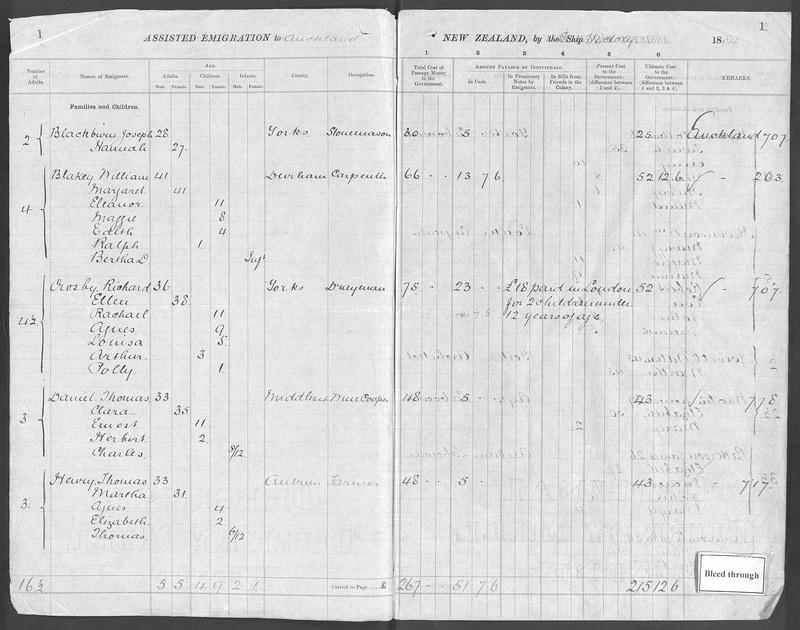 The records show that the Daniel family arrived in Auckland, New Zealand on 25 May 1884, on the ship “Victory”, which sailed from London, England 29 March 1884. They appear to have come to New Zealand as part of the Assisted Emigration Scheme – maybe the “Vogel Scheme” set up by the then New Zealand Premier Sir Julius Vogel. Thomas (33), Clara (35), George (14) Ernest (11), Herbert (2) and Charles (8 months) are all listed on the passenger list (note Elsie was born in New Zealand). George was listed separately from the rest of the family – it could be that he was seen as an adult at the age of 14 by the immigration authorities. The Assisted Passenger List from the “Victory”. Thomas was listed as a Wine Cooper and from Middlesex, passage cost was £48 + £15 for George, they put up £5 + £5 for George and the Government covered the balance. A cooper is someone who makes wooden, staved vessels, bound together with hoops and possessing flat ends or heads. Examples of a cooper’s work include but are not limited to casks, barrels, buckets, tubs etc. Traditionally, a hooper was the man who fitted the metal hoops around the barrels or buckets that the cooper had made, essentially an assistant to the cooper. The English name Hooper is derived from that profession. With time, many Coopers took on the role of the Hooper themselves (extract from Wikipedia). From the 1881 England Census we have the family living at 78 Grafton Street, Hamlet, London, Middlesex. Thomas is 31 and head of the house, Clara 34, George 10, Ernest 6, Amy 1 and Thomas’ brother Charles 26. Both Thomas and Charles were Cellarmen, just like their father (see Thomas’ Birth Certificate). Cellarmen were persons in charge of the alcoholic drinks – traditionally the wine cellar in a tavern. From this we see that a daughter, Amy (born about 1880), who did not survive childhood to emigrate with the family to New Zealand in 1884. The first few years at his birth are unclear until he was at the age of three, when he claims to be on the soil of New Zealand, let loose in a field of green peas in the upper reaches of Auckland at Riverhead. The reference to his feasting on green peas was the memory of poohing in his pants. He had arrived in company of his mother and father and two other siblings. His father Thomas Daniel of, it is assumed, London, was widowed and had one son Earnest, and at some stage he later married a widow who also had one son named George. Whether there is a record of this marriage in existence I am unsure, but no doubt there is because the widowed persons concerned were the parents of Charles, and as noted above immigrated to New Zealand with the three siblings, one of whom, George, assumed the name Daniel by virtue of his mother’s marriage, or I should say re-marriage. Subsequently, of this union two other children were born to the Daniel group, who were Elsie and Herbert. Thomas Daniel first marriage was to Julia Phillis Pedder (1855 – 1874) – they married on 18 September 1871, he was 21 and she was 16. This marriage produced one son Ernest. Thomas’ second marriage was to Clara Emma Barrett nee Holmes, a widower, she had one son from her first marriage, George. This second marriage was at St Simon Zelotes, Bethnal Green, London on 6 May 1878. Thomas was brought up in London’s East End, Stepney, it was one of the poorer districts in London, and it developed a reputation for poverty, overcrowding, violence and political dissent.